Combine brownie mix with the oil, water, and eggs. Pour into a greased 13x9 inch pan and bake for 25-35 minutes or until cake tester comes out clean. Combine softened cream cheese with 1/4 cup of the caramel dessert topping. Spread cream cheese/caramel mixture over cooled brownies. 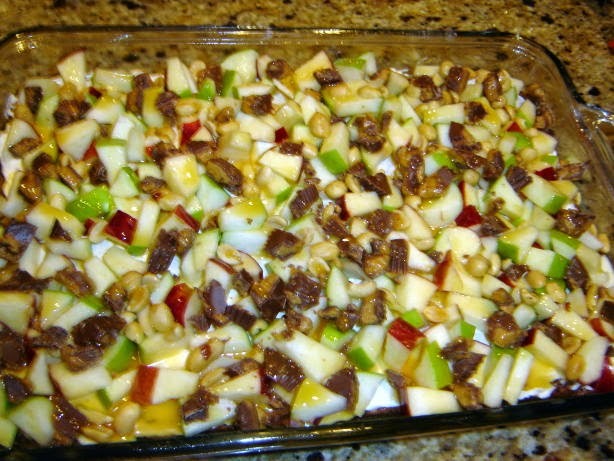 Sprinkle chopped apples, peanut butter cups, and peanuts over the cream cheese/caramel mixture. Drizzle remaining caramel dessert topping over the dessert.